build your hopes on things eternal, hold to God’s unchanging hand. If by earthly friends forsaken, still more closely to Him cling. Seek to gain the heav’nly treasures; they will never pass away. Fair and bright the home in glory your enraptured soul will view. This old song from my youth says, "Time is filled with swift transition." One of my favorite hymns, the lyrics are conveying to us that time is passing away from us quite quickly—and one day we will be numbered indeed among the dead. In a section warning against presumption, in the epistle of James, we find that the uncertainty of life, its complete dependence on God, and the necessity of submitting to God’s will all help us to know and to do what is right. I have no idea what my life will be like tomorrow; and I am reminded, "You are a puff of smoke that appears briefly and then disappears" (4:14). I fervently pray, that when my earthly life is completed, I will enjoy seeing the face of God at the eschatological banquet. May we keep ever before us this certain realization: Only when God is placed first are our lives well spent. In the various talks I have given around the country over the years, I often refer to Jesus asking Peter whether he loves him (Jn 21:17). Jesus asks us the same question every day, “Do you love me?” It is not a question of faith so much as it is a challenge to a commitment for each of us. If we truly love the Lord, we must take care of one another—we must love one another. Illustrated throughout the Gospel by his words and deeds is the command of Christ to “love one another” (Jn 13:43). Each November, the U.S. Conference of Catholic Bishops sponsors the Catholic Campaign for Human Development (CCHD) collection. Through the generosity of Catholics throughout the country, CCHD is able to provide much needed funding to groups whose work reflects Catholic social teaching in terms of the intrinsic dignity of human life. A preeminent objective of CCHD is to fund groups whose very efforts are to effect positive change in the policies and social structures which weaken dignity, particularly for the underprivileged and defenseless. Support of the annual CCHD collection helps the socioeconomically disadvantaged improve their lives, overcome injustice and escape poverty. Pope Francis reminds us to not allow the spirit of global solidarity to be lost in times of crisis and economic hardship. As Catholics, we are united through the sacraments of initiation; and “the Eucharist commits us to the poor” (CCC, 1397). Participating in the work of CCHD helps us not only to reach out to those on the peripheries, but also to give hope to those in despair. During his Apostolic Visit to the United States in 2015, the Holy Father succinctly reminded the nation through his address to the Joint Session of Congress, “The fight against poverty and hunger must be fought constantly and on many fronts, especially in its causes.” When the Christian faithful participates in this national collection, we are actively responding to the clarion call to live out the Gospel values by expressing an authentic priority to alleviate the hardships of the underprivileged and vulnerable as a labor of love. Everything we have in our lives is a gift; and we know God cannot be outdone in generosity. As we proclaim the gospel of life and justice, celebrating it in the Mass and in our whole existence, may the way we are to be in the communion processional be the way we are in the world because “in prayer, there are no rich or poor, there are sons and daughters, sisters and brothers” (Pope Francis). While recognizing the harsh realities that conversations about migrants and asylum seekers in American society causes fear and division — even among “church-going” people — and considering that Jesus, Mary and Joseph were refugees who fled the violence of Herod, could it be possible that we would be more understanding of their plight because we know their story? Fruitful encounter is so very important because it reminds us of our Christian responsibility to ensure that all persons, regardless of status, have inherent human dignity that must be respected. We are called to lead by example by contributing ourselves individually and collectively not by mutual exclusion, but by equality in dignity. 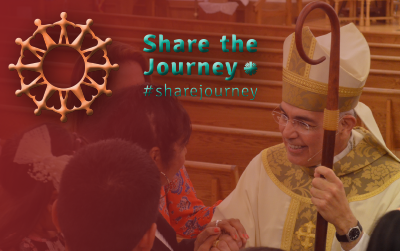 The Share the Journey campaign is important because it is about human dignity. This campaign compels us to appreciate the sacred dignity of migrants and refugees as children of God, recognizing that life is sacred, regardless of the color of our skin, our ethnicity, or our nationality. After all, are we not tasked with reminding our communities that we all sit around the Eucharistic table without regard to the distinctions of nationality, ethnicity, age, gender, or whatever labels society uses to divide us? Let us pray for a just solution to mitigate the fear, uncertainty and terror that finds itself as a part of the migrant and refugee experience in the U.S. As we continue to bring the message of Christ to all people, we must continue to ask the God of wisdom and justice, through whom authority is rightly administered, to assist with counsel and fortitude all government leaders. Let us continue, in keeping with the instruction given in the first epistle to Timothy, to pray for our nations, legislatures, members of parliaments and all who are in authority (2:1-3), that they may reject the temptation of indifference and adopt sincere hearts of encounter. May the great challenges that are facing our communities today, and in our future, be met as great opportunities! May the Mother of God, through her never-failing intercession, always watch over us, with all our blessed diversity, as we strive to do the work of her Son in this world. May our work be in perfect harmony with the eternal teachings of Christ, and may the Gospel message come alive through each of us this Respect Life Month and forever!